Back cover blurb: When the past catches up, do you run and hide or stand and fight? When a woman is brutally attacked on a lonely country road by an escaped inmate from a nearby psychiatric hospital, Sergeant Davie Gray must track him down before he strikes again. But Gray is already facing a series of deaths connected to legal highs and a local fairground, as well as dealing with his girlfriend Marie's bizarre behaviour. As Gray investigates the crimes, he suspects a horrifying link between Marie and the man on the run - but how can he confront her when she's pushing him away? As a terrified Marie is pulled back into a violent past she thought she'd escaped, she makes an irrevocable decision. And when events come to a head at a house party on Willow Walk, can Gray piece together the puzzle in time to stop the sleepy town of Banktoun being rocked by tragedy once more? SJI Holliday's second novel is once again set in the small Scottish town setting of Banktoun. And although this is the second novel in Holliday's Banktoun trilogy, you don't have to have read the first, Black Wood to be able to read this. Willow Walk works well as a standalone novel. But I do suggest you read Black Wood if you can, as you've missed a treat if you've not already been introduced to Banktoun and its residents, particularly the rather lovely Davie Gray. Willow Walk's beginning; a rather creepy and nasty prologue, has you, the reader, straight in at the deep end, the morning after a party, where something has clearly gone very very wrong. Local Police Sergeant Davie Gray is investigating the use of legal highs in Banktoun and the surrounding are when he is called to the local hospital by a colleague. A woman has been brutally attacked and Davie may be able to identify her. Davie fears the worse, his new girlfriend Marie is supposed to be at work. But what if she's not? Thankfully the victim of the attack is not Marie, who works behind the bar of the local pub. Her relationship with Davie is still in its infancy so when she begins to receive some disturbing letters, the last thing she wants is police involvement. But Marie is scared, scared that the letters mean she's about to be forced to relive a past she thought she'd escaped long ago. When it transpires that an escaped psychiatric patient is suspected of attacking the woman mistaken for Marie, Marie's worst fears begin to come true. The closer Davie tries to get to Marie the more she pushes him away. Can Davie figure out what's going on before tradegy occurs? Or will the Police become distracted by the arrival of the local fair and a resurgence of dangerous legal highs. The quiety sleep town of Banktoun is about to be awakened in the worst possible way. 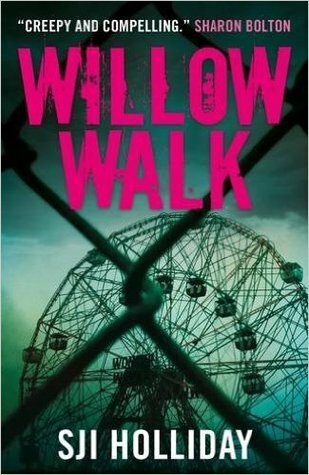 Willow Walk is a brilliantly creepy and atmospheric novel that will grip you from its first page. Willow Walk is available from 10 June 2016. You can pre-order it now via Amazon online and Black & White publishing.